Earlier, a question came in asking why we have not mentioned Tropical Storm Danny, which may become a hurricane, on the blog? 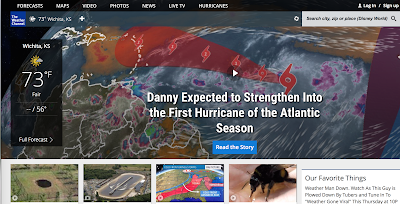 I did mention Danny when it was named and mentioned it would likely become a hurricane. That is plenty considering it will be more than a week before the storm could reach the U.S. -- and that is the unlikely path. There is no reason to get excited at this point. The "Danny" story rotated with three others, meaning it was on the page only 1/4 of the time. 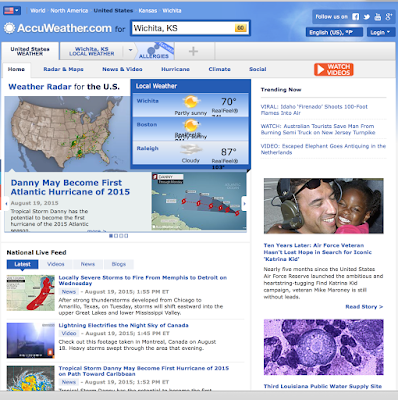 So, if you want balanced hurricane coverage throughout Danny's life, I highly recommend AccuWeather. Of course, if it looks like it will become a factor for you USA, I'll cover it here, as well.